Wilson, 29, has played the past six seasons (2012-17) with Seattle. 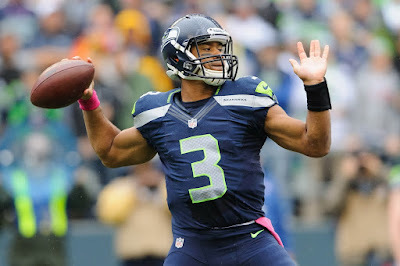 A four-time Pro-Bowler, Wilson has completed 1,815-of-2,834 pass attempts (64.0 percent) for 22,176 yards and 161 touchdowns. He has compiled a career starting record of 65-30-1. In 2017, Wilson led the NFL with 34 touchdown passes. "We've admired Russell's career from afar for quite some time,” Yankees General Manager Brian Cashman said. “This is a unique opportunity for us to learn from an extraordinary athlete who has reached the pinnacle of his profession. “After talking to a number of our players, there is a genuine excitement in having Russell join us for a short time in camp. We are all looking forward to gaining insight into how he leads teammates toward a common goal, prepares on a daily basis for the rigors of his sport, and navigates the successes and failures of a season." Wislon, a Richmond, Va., native, does have a baseball background, as he was originally selected by the Colorado Rockies in the fourth round of the 2010 First-Year Player Draft, and was acquired by Texas in the minor league phase of the 2013 Rule 5 Draft. In 2014 and ‘15, Wilson participated in team workouts at Rangers spring training camp. In 93 career minor league games between Rookie-level Tri-City (2010) and Single-A Asheville (2011) in Colorado’s system, Wilson hit .229/.354/.356 (72-for-315) with 58R, 9 doubles, 8 triples, 5HR, 26RBI and 19SB. In his last 15 games with Asheville in 2011, Wilson hit .302 (16-for-53) with 13R, 5 extra-base hits, 9RBI and 5SB. A two-sport athlete in college, Wilson graduated from North Carolina State University in 2010. Using his last year of amateur eligibility, Wilson enrolled at the University of Wisconsin and quarterbacked the Badgers to a co-Big Ten Championship and a Rose Bowl appearance following the 2011 season. Wilson is expected to be in Major League camp in March. While he is in Tampa, Wilson will participate in pregame workouts with the club and watch games from the Yankees’ dugout. He will be assigned to the Double-A Trenton roster.